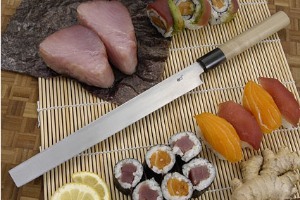 Description: The takohiki, or octopus slicer, is a traditional Japanese sashimi knife that developed in Tokyo. Its square tip allows a chef to cut cooked octopus, which curls up when cooked, without damaging the uncooked section. Tojiro Suminagashi Traditional knives are hand forged by masters in Niigata, Japan. The knives are not only impressive in appearance, with their distinctive damascus pattern, but their performance is legendary. 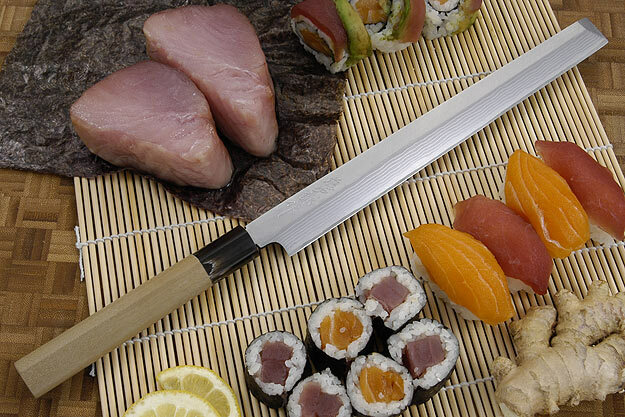 Aogami is one of the highest quality and hardest steels used in Japan. 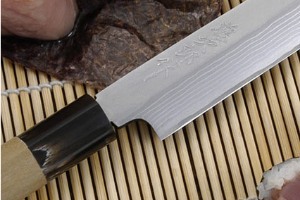 This cutting edge (hagane) is supported by many alternating layers of damascus. This technique results in a blade that is very strong, yet fairly easy to re-sharpen. Because aogami is a carbon steel, these knives must be dried after use to prevent rust or tarnish. The right-handed 'D' shape handle fits comfortably and securely in the hand and is best used by a right-handed user. It is formed from ho wood, the traditional wood for Japanese handles. This wood, which is a relative of magnolia, holds up extremely well in the harsh environment of the kitchen. A buffalo horn ferrule adds nice contrast.